An UP Aerospace, Inc., SpaceLoft XL suborbital rocket is shown attached to its launch rail at Spaceport America in New Mexico. The ashesof a Titanic shipwreck explorer are poised to launch into space on Saturday ina suborbital memorial service to blast off from New Mexico. A smallportion of the cremated remains of Ralph White, a cinematographer whodocumented the 1985 expedition that discovered the wreck of the RMS Titanic,will fly to suborbital space and back alongside the ashes of 15 other peoplewhen their SpaceLoft XL rocket launches from New Mexico?s Spaceport America atabout 10:00 a.m. EDT (1400 GMT) on May 2. 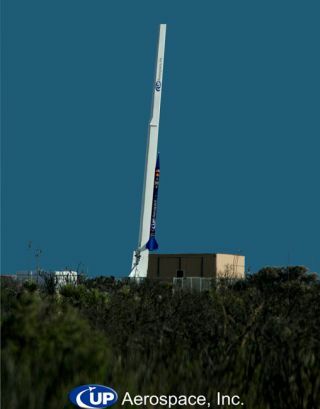 The plannedlaunch will mark the thirdliftoff for UP Aerospace, the Connecticut-based builder of the SpaceLoft XLrocket. It is also the second suborbital Earth Rise flight for Celestis, Inc., aHouston firm that offers a range of memorial spaceflight services that include burialin deep space, Earth orbit and even on the moon. "Ralph'swish was for his ashes to be scattered all over the world by his friends andfellow adventurers," said White's fiancee Rosaly Lopes in a statement,adding that his ashes have already been to all seven continents. By the timeof his death in 2008, White had accrued more than 30 years of productionexperience as a cinematographer, video cameraman and editor. In addition tochronicling the Titanic wreck?s discovery in 1985, he also co-directed asubsequent salvage operation that recovered more than 5,000 artifacts form theill-fated luxury liner?s debris field. White made more than 35 dives insubmersibles to the Titanic wreck, which sits 12,000 feet (3,657 meters)beneath the waves of the Atlantic Ocean. The Titanic sank on April 14, 1912after striking an iceberg. Celestishas christened Saturday?s launch the Discovery Flight. The company?s lastmemorial spaceflight - the Legacy Flight - launchedin 2007 carrying the ashes of about 200 people, including "StarTrek" actor James Doohan and Mercury astronaut Gordon Cooper. Like thatflight, the SL-3 mission will launch on a SpaceLoft XL rocket to an altitude ofabout 70 miles (112 km). The rocket?s payload-carrying section is expected toparachute back to Earth so families can recover the ashes of their loved ones. Accordingto Spaceport America officials, the SpaceLoft XL rocket will also carry severaleducational payload canisters into suborbital space for New Mexico university,community college and high school students. One is OSCER-Sat, an experimentpackage to study how flight components operate at suborbital altitudes, wasbuilt by New Mexico State University while another was assembled by theUniversity of New Mexico to test spaceflight systems. A third educationalpayload, called RocketSat is a community college experiment to test spaceflightsensors. UPAerospace?s SpaceLoft XL rocket is a single-stage booster fueled by solidpropellant that is capable of launching up to 110 pounds (49 kg) payloads onsuborbital flights that reach 70 miles above Earth. The rocket is about 20 feet (6 meters) tall and each launch takes about 15minutes from liftoff to parachute landing.